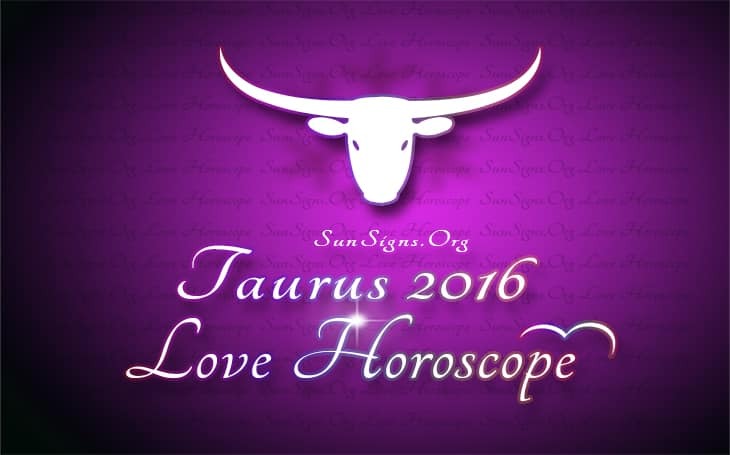 Taurus 2016 Love Horoscope predicts that the year 2016 portends to be a highly energetic and blissful year for both romantic and social lives of the Bulls. You will have opportunities to get into both social and love relationships. Electronic media plays a major role in Taurus dating adventures. You will be able to interact with others and exchange your ideas and sentiments freely. The 2016 love astrology forecasts for the Taureans foretell that planetary positions are generally favorable for love and social relationships. However when the planets are not favorable, you should not take your relationships for granted. You should nurture your partnerships irrespective of the challenges that you are likely to come across during Mercury retrogrades. During the months of February and April 2016, you pay undivided attention to your friendships, while from June to November 2016 your unconventional behavior and creativity may be a source of irritation in your relationships and leading to a breakup if you are not careful. Taurus in love in 2016 will be highly gratified with fascinating relationships. Single bulls in pursuit of love will be successful in finding their right partner from the month of February to June 2016 and again from October to December. Month of April will make you attractive and you will be able to forge new serious love partnerships. Read more in the 2016 numerology horoscope. The 2016 Taurus love predictions suggest that in the month of April 2016, you should be more diplomatic while expressing your innovative ideas to your partners. You will draw them towards many social engagements and you will provide them with all the encouragement needed for the occasion. The 2016 marriage forecasts predict that the family environment will be volatile between January and April 2016 because you tend to be non-committal towards the family. It is imperative that you should not engage yourself in squabbles with family members and should strive towards maintaining a harmonious relationship with your spouse. If you are looking for a second union, period after March 2016 will be favorable. The marriage will be stable and long-lasting. Your partner will be reliable, conservative and probably senior to you in age. Because of the age and experience, your lover will be more dominating but highly compassionate. Taurus looking for a third marriage in 2016 will also be successful in finding a partner. Your companion will be quite charming and interested in artistic and religious pursuits. Romance is to be found while you are chasing your professional ambitions or in the work environment. The partner may be a colleague or even a senior. Taureans in committed relationships are likely to get married during the month of May 2016. July 2016 will be scorching for Taurus zodiac seekers of love and the burning desire will continue till the month of September 2016. You are sure of your needs in bed in a romantic relationship and expect your partner to appreciate your sentiments. Pregnancy is also on the cards for the Taurus men and women. October 2016 is spent in reviewing your previous experiences in love and in formulating new strategies to seek your true soul mate. November will be ideal for forming new Taurus relationships with excellent sexual bonding. The 2016 Taurus love horoscope also foretells that you are looking for romantic love rather than passionate one. Chances are that you will be able to meet a partner to suit your requirements during 2016. Love for the bulls is to be found in religious and spiritual environment. You may find your love mate in charitable gatherings or while performing humanitarian deeds. To conclude, the 2016 Taurus love compatibility predicts that that there is a divine force at work while you are getting into a relationship. Your intuition will lead you to finding the perfect love companion. Keep a look out for love 2017 horoscope for Taurus.